Well, it is getting to be that time isn’t it. Tomorrow is the holiday that we in America call Turkey day…I mean Thanksgiving Day. After all, not all of us eat Turkey, and all of the turkeys that survive T-Day are ever thankful for that! All jokes aside, this is the holiday that begs Americans to remember the story of the Pilgrims. When the Pilgrims landed in Massachusetts in 1620, they were not prepared for life in the wilderness and they did not really know what to grow or when to grow it. Enter in the Native Americans, namely the Wampanoag tribe, who taught the settlers how to survive (including how to grow and harvest their food) in exchange for protection against tribal enemies. By the time of the first Thanksgiving meal, there were only 50 out of 100 Pilgrims alive to share in the meal. Half of them had died during the first winter in the New World. Those remaining Pilgrims invited 90 Wompanoag to share with them in a feast, as a way of giving thanks to them and to God for their alliance and survival. Of course there is a ton more to the history than what I have recounted here; however, this is the gist of the story that the Thanksgiving Day observance in the U.S. is centered on. 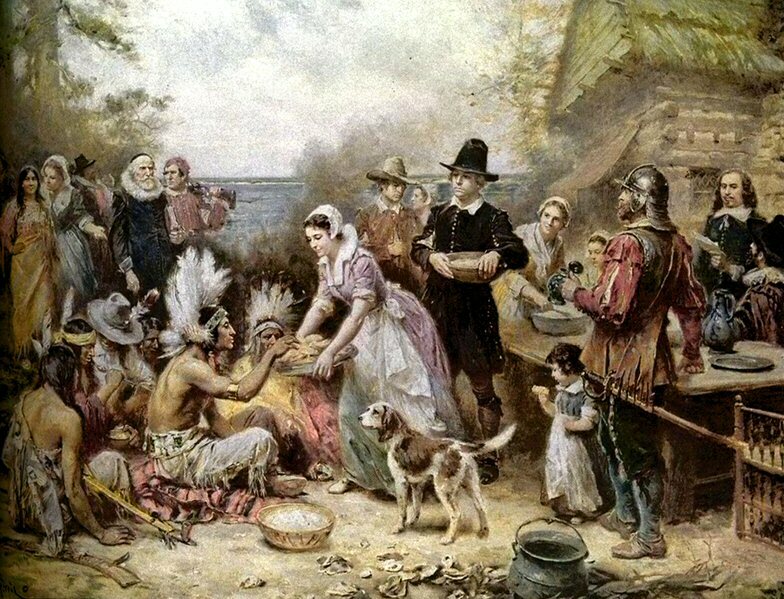 Of course, it wasn’t long before more settlers showed up in Massachusetts and it is quite unfortunate that the original thankfulness that the Pilgrims had shown toward their Native American neighbors had all but been forgotten. The rest is sadly history. The European settlers flourished and grew in numbers, while the Wampanoag suffered major losses in their population. The European settlers, unbeknownst to them, brought bacteria and illnesses which killed many within the Wampanoag tribe. On top of that, with the European settlers came Western Civilization and it’s wars. One such war was King Phillip’s war, where the English colonists and their Native American allies fought against other Native American tribes. During that war, the Wampanog lost over 40 percent of its population and many of the surviving males in their tribe were sold into slavery in the West Indies. On top of that, many of the women and children were enslaved in New England. So much for the spirit of thankfulness, huh? While this may seem like ancient history, the fact remains that the very feast we partake in year after year is rooted in that ancient history. What’s more, like the original Thanksgiving between the Settlers and Wampanoag tribe, our Thanksgiving is so short-lived that we often forget what we were even thankful for before the turkey, or Tofurky, coma settles in. In fact, it seems like our thankfulness is, by and large, nothing more than a trivial tradition that bears little resemblance to true thankfulness. The challenge for us is become a truly thankful people who do not trivialize such an important part of what we were created to be. Let us begin to truly be thankful for everything we have been given. Too often we express our thankfulness through words, but words are so often very cheap! The first Pilgrims did not express their thankfulness merely with words, but through their actions in protecting their Native American allies and through inviting them to share in their harvest feast! Let us, too, be a people who show God that we are truly thankful by sharing what we have with others, no matter how unlikely it may seem for us to have a relationship with them. God has created us all and has provided all of us with all that we need. If we are truly thankful for those things, and if we truly recognize that everything we have are gifts from God, then we will not hesitate in being generous in our giving and THANKFUL in our living! This Thanksgiving, make thankfulness the meat that you feast on! Gracious God, I thank you for all that I have including my life. Give me the strength take what I have and share it with those in need, so that my thankfulness can move from words into action. Amen.